There are so many areas of New York that beg to be experienced hand in hand with a partner. From breathtaking architecture, intimate hotels, natural wonders, and ultra-romantic restaurants, the state has a plethora of dreamy places to see and things to do. Here are 15 of the most romantic places in New York State. New York City has no shortage of impressive buildings, but there’s something so romantic about wandering around Central Park with your sweetheart. Central Park is a quiet retreat from the hustle and bustle of the city, with plenty of sweet spots, like ice skating rinks, the Bow Bridge, and Belvedere Castle. Visiting a winery is among the most romantic couples’ activities you can do, and on Long Island’s serene, gorgeous North Fork, there are plenty of amazing options. Sip vino with your significant other at Martha Clara, Bedell Cellars, and Wolffer Estate Vineyards, to name just a few. Widely considered to be the most romantic restaurant in New York City, this historic West Village restaurant is in Aaron Burr’s old carriage house. The interior is adorned with candlelight and fireplaces. Couples listen to live piano music as they contemplate the decadent menu. This historic, award-winning Victorian castle resort provides acres of natural splendor to its guests. With your stay, you’ll enjoy plentiful hiking, cross-country skiing, and ice skating opportunities, along with a choice of delicious fine dining. A bucket-list destination for many couples, it’s hard to beat Niagara Falls when it comes to making an impression. Try visiting during the day and again at night, when the falls are lit up with colorful, romantic lights. This 40-acre walled Persian garden is a popular engagement spot in Yonkers. It’s a lovingly restored early 20th Century masterpiece, with stunning landscaping, architecture, and views of the Hudson River. This historic landmark train station has been known for taking visitors’ breath away. Gaze up at the night sky painted on the ceiling of the main concourse, shop in the markets, and whisper secret messages to each other in the whispering gallery. Ever wanted to try glamping? You can do it in Ithaca’s Firelight Camps, where camping is elevated. The stylish resort is modeled after luxury safari camps in Africa, and it’s located right near Buttermilk Falls State Park. Hop in the car or on a train, and head out to the farthest end of Long Island, which is also the easternmost part of New York State. At the land’s end in Montauk lies an important historic lighthouse. Visit the lighthouse’s museum, and climb all the way to the top. Afterward, enjoy a stroll along the jetty as you watch the waves crash. This critically acclaimed farm-to-table restaurant sources all of its food from the abundance of local farms in the Hudson Valley. Although it’s situated on a working farm and educational center, the dress code is “elegant” and the ambiance is chic. Deemed the “Grand Canyon of the East,” Letchworth State Park will take your sweetheart’s breath away. Hike along the miles of trails along the canyon and take plenty of pictures together. With over one million species of plants and beautiful old buildings, New York Botanical Gardens has potential for a unique day date. Stroll along the Bronx River with your love and check out the only remaining section of old-growth forest in New York City and a cascading waterfall. 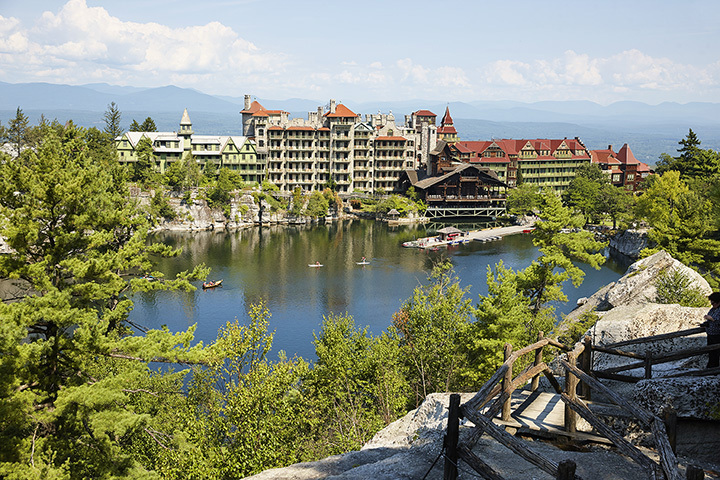 Rustic, candlelit rooms and incredible views of Lake Placid and Whiteface Mountain make Lake Placid Lodge one of the best hotels in the country. When you book a stay there with your love, you can enjoy upscale dining at Artisan and tour the lodge’s very own wine cellar. Boldt Castle was built by millionaire George C. Boldt as a summer dream home for his wife, making it the most romantic spot in the Thousand Islands region. Located on a heart-shaped island in the Saint Lawrence River, the now-restored castle is only accessible by boat, and is open to visitors in the summer. With a location right on the Hudson in Poughkeepsie, it’s easy to see why Shadows on the Hudson is a popular date spot. Luxurious and beautiful, the American restaurant is known for its brunches and prime rib.